Scotland is a land of variety and contracts. It has towering mountains, glens, and valleys, rich culture and history. Its soft-spoken people and unique attractions make any visit memorable and enjoyable. 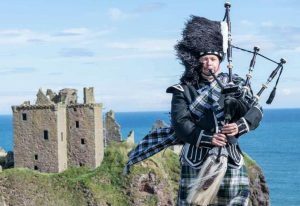 The following are three things a person must experience on a visit to Scotland. Base rock is windswept 350 ft basalt stump north east of Edinburgh. Its lighthouse beams across the inlet of the Firth of Forth. Once a retreat and penal colony, it is home to over 10,000 gannets. The gannets are an intriguing sight. They home in January. Visitors can watch them dive for fish, their necks and beaks pointed skyward. Watch them throw up spray as they hit the water in a fantastic fit that stuns fish and people. Boat excursions from the port of North Berwick take visitors around the base rock for a closer look. On stormy days visitors watch videos about life on Base Rock at the Berwick seabird centre. No visit is complete without the echoes of the Scottish highland bagpipe. The bagpipe is a unique antique. It is the only musical instrument that is a banned weapon of war. No Scottish regiment could march without a piper. So, the bagpipe, in the eyes of the law, was an instrument of war. Visitors can listen to bagpipers during the famous Edinburgh international festival. Fingal’s cave is the Scottish end of the traditional giant causeway. The natives say linked Scotland and Ireland. In reality, the basalt columns formed from past volcanic eruptions. One such column is Fingal’s Cave. It stands northeast of Staffa Island. The beauty of the giant hexagonal columns inspires admiration for the power of nature. Visiting Scotland can be amazing. Watch the fantastic divers at the base rock. Listen to the resonant melodies of the bagpipe. Regale in tales of legendary causeway builders. Make visiting Scotland memorable.